It’s a wonder there was enough ink in the world to cover all the media attention given to QE. This was, no doubt, very much to the Fed’s liking. Tons of media coverage sending a very clear message: The Fed is buying assets. Tons and tons of assets. Doesn’t it stand to reason that this will make asset prices go up? Shouldn’t you buy too? Benefit from the Everything Bubble. Just buy. Don’t think. And now that the Fed is destroying the same liquidity it so aggressively injected into the markets, how often do you hear about it? Hardly at all, from any quarter, which is, no doubt, very much to the Fed’s liking. Because the other side of QE is QT and its corresponding message that the Fed is not nearly so eager for you to hear: We are now net sellers, on a large scale, and we will be for years to come. Doesn’t it stand to reason that this will make asset prices go down? Shouldn’t you sell now before we put more pressure on the very same asset prices we once inflated? As the Fed attempts to tiptoe out of the markets it entered with such blaring fanfare, the below chart demonstrates how the Fed singlehandedly engineered the stock market bubble via QE…and what is that bubble’s likely future trajectory, as it once again follows the Fed’s lead, this time as it sells for years to come. It took the Fed five-and-a-half years to amass $3.4 trillion in Treasury securities and mortgage-backed securities (MBS) during QE, including the year 2014 when it was “tapering” QE to zero. 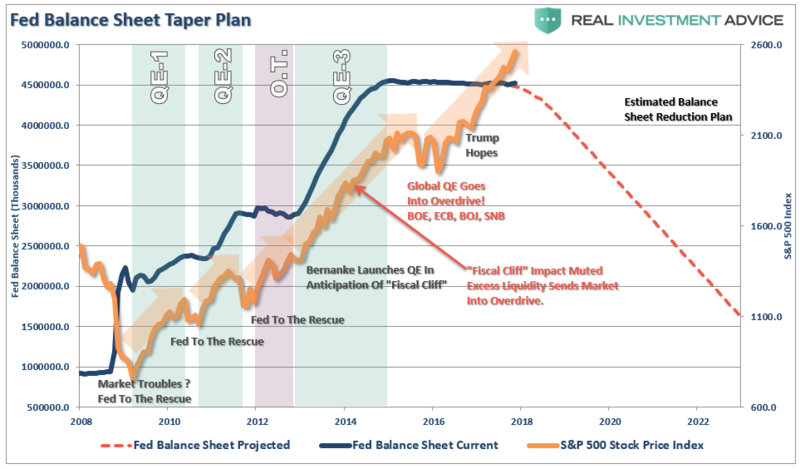 The Fed is now reversing that process, including the opposite of “tapering,” as it is ramping up its QE unwind. Just as the Fed created money to buy Treasuries and MBS during QE, it now destroys money when Treasuries and MBS “roll off” the balance sheet. The money just disappears to where it had come from – nothingness. Just like QE added liquidity to the markets, the QE unwind is draining liquidity. QE was associated with enormous media hoopla for maximum “wealth effect” in terms of asset price inflation; but the QE unwind happens quietly, on autopilot, and the media is silencing it to death.